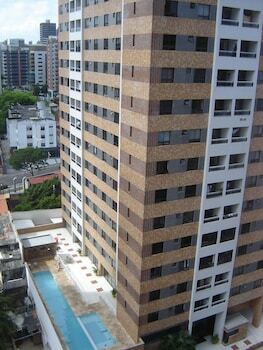 With a stay at this apartment in Fortaleza, you'll be by the sea and minutes from Mucuripe Beach and Iracema Monument. Featured amenities include luggage storage and an elevator (lift). Free self parking is available onsite. With a stay at Apartment Lacqua Di Roma I Via Caldas in Caldas Novas, you'll be within a 10-minute drive of Acqua Park diRoma and Japanese Gardens. Free self parking is available onsite. Located in Lencois, Casa da Dinda is minutes from Senhor dos Passos Church and Praca do Coreto. When you stay at Pousada L'escale in Buzios, you'll be near the beach, within a 15-minute walk of Orla Bardot and Joao Fernandes Beach. The front desk is staffed during limited hours. When you stay at Pousada Sarata Armação in Buzios, you'll be near the beach, within a 10-minute drive of Ossos Beach and Joao Fernandes Beach.